Hi guys! 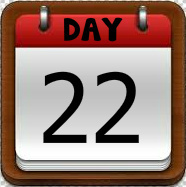 It's Day 22 of our 30 Day Challenge! Time to take another weekly progress photo! How are you guys doing? Your new eating habits should finally be much easier. Are you still struggling with giving up certain foods? If you’re like me and feel like you’re never gonna get rid of that darn sweet tooth, find healthy alternatives to satisfy your cravings. Take a look at my recipes, I have some great ones for protein “cookies” and dessert like protein shakes. How’s your workout routine going? Are you able to find at least 20 minutes a day, 6 days a week to get your muscles working? Since we’re pretty much on our last week, if you’re not challenging yourself yet, you should really step it up, get strict and work hard these last few days! No excuses! Turn the last week into a “7 Day Challenge” (or 8 since there are 8 days left, a little longer than a one week challenge). * M1 (meal 1) - (slow/complex carb, protein, healthy fat, fruit (coffee or green tea if needed)) Example: Oatmeal cooked with water and stevia and or cinnamon for taste (if needed), splash of almond or coconut milk, topped with fruit, side of 2 eggs. * S1 (snack 1) – Example: Apple or banana with peanut butter, plain greek yogurt or cottage cheese with ½ fruit, 1 slice toast with 2 hard boiled eggs, handful of almonds. * M2 – Example: Chicken, tuna or lean ground turkey with veggie of choice (optional extra sides, brown rice, quinoa, ½ sweet potato), you could make this a salad, you could add avocado, olive oil, pepper, to taste. Drink 8 oz or water with lemon. * S2 – Example: any of the above snack examples. If you’ve worked out after lunch, have a post-workout protein shake, if you get a mid day sweet tooth, have a homemade protein cookie. * Complete today’s workout routine if you haven’t already! * M3 – Example: Lean meat such as chicken, tuna, salmon, tilapia, lean ground turkey and veggie of choice. Could add lemon juice, pepper, mustard, olive oil or vinegar to taste. Or hearty post-workout protein shake (include a veggie, spinach is a great addition to shakes!). * Finish the water needed for the day, be mindful of how late you’re drinking large amounts of water so that you’re not up peeing all night! * S3 – (this could be a “healthy dessert option”) Example: protein pudding, protein cookie, chia pudding, grapefruit with stevia, frozen grapes. * Go to bed early enough to get your 8 hours of sleep! If you notice that you’re needing more activity in your day, find times to add some random movement. This would be perfect if you have a sedentary job. Find something you do often, such as, go to the rest room, answer the phone, text someone, walk down a hall, send an email, etc and find something to do each time you do that/those things, such as 10 squats, 15 jumping jacks, walking lunges, 10 push-ups, 30-60 sec plank, etc. Example: each time you use the restroom – 10 squats. Don’t walk down the hallway – do walking lunges down it, or skip! You could even do all of these things before you take a shower, before getting into bed, before you eat each meal OR all of the above! Oh, and always take there stairs, there is not such thing as an elevator or escalator!! Get the idea? Since we only have 8 days left, make them count! Make yourself proud! Also, since we only have 8 days left, you might have thought about what you’re going to do when we’re done, how you’re going to stay on track and not slip back into old habits. I will be discussing this in a later post. We’ve made it so far, we don’t want to ruin it all when we’re done! Good luck with these last days guys! You can do it!